ISO files are disc images, typically copies of CD or DVD’s. Games and software that are shipped in CD or DVD format are often saved as disc images for future use, in the case of CD damage or lost these files can be useful as a backup to the original program.To use these disc images at a later time you might want to burn them to CD or DVD again, but there is an easy and economical solution to this, that is by using a virtual drive software you can mount ISO files and other disc image files without burning DVDs. Microsoft has a freeware utility that will work on older operating systems, but when it comes to Windows 7 or Vista it won’t work. 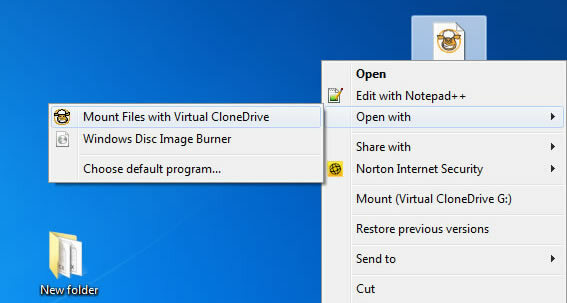 There are several freeware utilities from third party developers which can be used to mount ISO files to virtual drives. 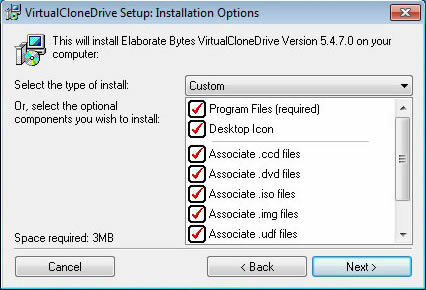 I am currently using Virtual Clone Drive, which a freeware utility and works perfect for the purpose. It supports .ISO, .CCD, .DVD, .IMG, .UDF, .BIN files. This is a small utility, download the utility to your drive and install the software. It will install drivers at the end of the setup, let it do that otherwise the program won’t work. You might also want to reboot your computer before using he software. After installing you can just double click any ISO file to mount it as a virtual drive. 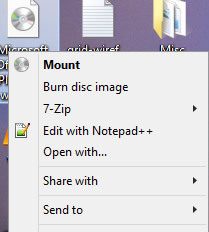 Alternatively you can also right-click and mount or unmount files using the context menu.